Are you still looking for that perfect party favor for your guests to take home? Party-O-Matic Photo Booths now introduces photo frame party favors for your next event! Throughout the years, we’ve attended numerous special events only to see that the party favors that the host spent so much money and time on, had been left behind. There is no other party favor more unique and personal than a photo frame perfectly sized for your guests’ Party-O-Matic photos. Your guests will fall in love with this party favor, and they’ll be itching to steal their neighbor’s party favor as well! These photo frames are perfect for displaying your special memories. Their hard acrylic and durable plastic enclosures will protect them from the elements for years to come. These quality book sleeve photo frames are a perfect party favor, which are fun and affordable. 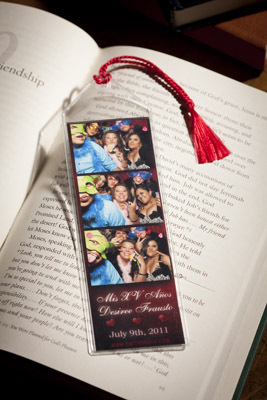 They are sized to fit your 2x6" photo strip and they’re fully customizable with your choice of color tassel. They are clear-coated so that guests can insert their two favorite photos. A book sleeve photo frame can be used as a bookmark, a hanging decoration, or any other use you can think of. This exceptional magnetic photo frames option is a great option for your 2x6" photo strip. A magnetic photo frame is a fantastic party favor ideal for decorating your fridge. The premium stand-up photo frame option is a fantastic option for your 2X6" photo strip. A stand-up photo frame is perfect for your office desk. This highly durable stand is ideal for a beautiful aesthetic party favor that will remind your guests of the wonderful event they attended. The 4X6" photo frame is perfect for your framing our largest print options. This frame is a great addition to any desk. These highly durable stands are a perfect party favor for your next event.